In The Buddha Made Me Do It, Marla Martenson takes us on a fascinating, roller-coaster ride as she races toward her long-term goal of trying as many spiritual modalities as possible. Just as enjoyable as her first two memoirs, Diary of a Beverly Hills Matchmaker and Hearts on the Line, this book takes us deeper – within Marla’s inner quest for spiritual enlightenment. The drama and the laughs are non-stop as she accomplishes the feat of becoming certified in Crystal Healing, Reiki, Life Force Energy Healing, and Psychic Development all while continuing as a matchmaker to superficial rich men, and the wife of a loving yet doubting partner. I thought I had personally tried every spiritual healing modality out there, and experienced everything from channeling to astral traveling. But having now read The Buddha Made Me Do It, I feel like I don’t need to go to any more Whole Life Expos… Marla did a thorough investigation into New Age spirituality, energy healing and the occult. She does most of her exploring with her side-kick Julie, but her engaging writing makes you feel like you’re right there with them. You can’t help but root for Marla and hope that one day you’ll have a chakra healing session from her. While there’s quite a bit of information about chakras, crystals and many forms of spiritual healing, this book is truly light and fun – a great read for anyone wanting to dip their toes into the metaphysical. The Buddha Made Me Do It can be considered a great recipe as to what to add and what to leave out in your own journey of self discovery. And the detox recipes she shares in the Appendix will help you clear the way. What sparked your interest in the spiritual/occult world? Marla: I have always had an interest in the occult since I was a little girl. Halloween was always my favorite holiday, fall my favorite season, and cemeteries a magical place to hang out and read the tombstones, imagining what the lives and personalities were like of the deceased when they were among the living. There is so much to discover in the universe, so much magic. I am never bored in pondering the possibilities, and hidden secrets. You tried many different spiritual/new age modalities – how did you know when you were on the right path? Marla: I enjoyed trying all of them. For me the right path is being open to new things. There are so many modalities to try, the only thing slowing me down is money. It can be an expensive hobby. I want to try everything! What made you want to become an energy healer? Marla: I had a session with a shaman/energy healer at a wellness faire in the Hollywood Hills. I loved the session so much and mentally made a note how cool it would be to do what he did. Then about a year and a half later, I signed up for a crystal healing class at the Imagine Center in Tarzana. My teacher mentioned that we could also add other modalities to the crystal healing such as Reiki. I immediately sought out a Reiki Master to study with, and the rest is history, I was hooked. How did you discover your higher purpose, and how would you describe it? Marla: I feel that my higher purpose is to offer healing to people. I discovered it through experience. I have witnessed first-hand how people love receiving Reiki and getting their energy field cleared and chakras balanced. It feels wonderful to be a part of someone’s shift. What advice can you give for others on a spiritual journey who are not supported by those around them? Marla: Stay true to yourself. My husband gave me a pretty hard time about all of the spiritual modalities I was studying and getting into. He felt that I was spending too much money, as well as getting into some things that he considered to be “fantasyland.” It hurt my feelings, but I was not about to let his fears or opinions stop me from pursuing my interests and joy. There will always be people who will try to chase you off your path because of their own fears or beliefs, but that is not your business. Your business is to stay on your path. It’s your life, so live it. In your work, what other realms do you contact and how do they support you? Marla: I am in contact with my guardian angels on a regular basis. They are located in the 7th dimension. I use a Talking Board. I tell the story of how I began the communication in The Buddha Made Me Do It. It was the most exciting thing that ever happened to me, when I had my first communication with my angel, Murth. Any advice on pitfalls others may fall into when they delve into the occult? Marla: When contacting spirits angels and other entities, one must be aware that there are also low vibrational energies that can be attracted to you and attach. Learning how to protect and clear yourself is very important. Is it possible for you and therefore, others, to maintain their traditional careers while also doing energy healing? Marla: I think that energy healing is something wonderful to have on the side of a traditional job. You can use it to heal yourself, your friends, family and pets. Even if you never go full out with it as a career, it’s fantastic to have in your toolbox. I give myself Reiki every night while lying in bed. The Buddha Made Me Do It is now available on Amazon.com. For more information, see www.marlamartenson.com. 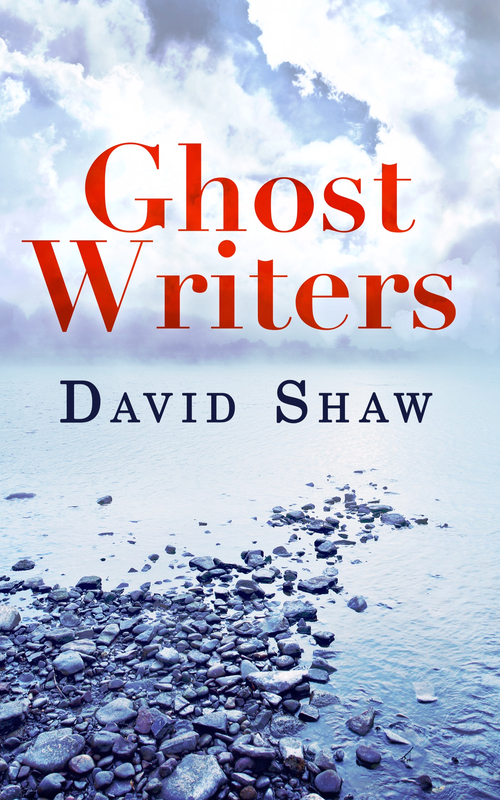 Ghost Writers by David Shaw was a surprise in that the basis of the book are 10 short stories channeled through writers including Tennessee Williams, Oscar Wilde, Beatrix Potter, Franz Kafka and Leo Tolstoy! All stories were delightful reads and inspiring examples of overcoming materialism, achieving forgiveness, fearlessness and self-belief, and the importance of education, patience, credence, tolerance, clarity and acceptance. Working with his own spirit guides, Shaw says he didn’t know who he would be channeling and, in fact, keeps the authors’ names secret until the end of the book. But his spirit team invited ten of the greatest writers of all time to share their stories through his mediumship. Shaw introduces 10 spiritual subjects that are then explored in the ten inspirational short stories. He sees his role to simply receive knowledge from the spirit world and pass this information on to the reader to help in your own life journey. From the first story, “How much is that doggy in the window?” I was hooked, and expect most other readers will be too. “Don’t fear the reaper” and “The Time Machine” were other stories that I found especially beautiful and profound. While I meditate daily, I’ve never tried to actively channel information from those now in the spirit world. Shaw gives us a view on how he achieves this, leaving us with a lot to think about, and a lot of information that can inspire us to live better lives. And he leaves me wondering – how many of our own creative efforts are a result of thoughts communicated from another creative mind, whether through channeling, inspiration or in our dreams? BECCA: Can you describe how you became a medium? DAVID: I actually fought against becoming a medium for many years. I spent many sleepless nights trying in vain to stop spirit people from entering my bedroom and terrifying the life out of me, until eventually I was diagnosed with Chronic Fatigue Syndrome. I then had two choices – keep fighting against it until it kills me, or embrace it. Thankfully, I chose the latter and began my lifelong apprenticeship. BECCA: Who is included in your “big team” of spiritual guides? DAVID: The “big team” of spiritual guides is a collective consciousness of highly educated minds that dwells within the highest realms of the spiritual Universe. I first became aware of this consciousness when I was involved with séances and deep trance mediumship. Mr Chung and SiBir are two guides who dwell within this collective, as are some great mediums from our past, like Gordon Higginson and Maurice Barbanell. The “big team” predominantly work with deep trance and physical mediums. BECCA: Ten different spirit authors wrote these beautiful fictional stories – did you write the factual words or were they also channeled? DAVID: The knowledge contained within the factual words was dictated to me through a very light trance state – by Mr Chung. Afterwards, I was able to format the information into my own writing style, occasionally adding humour and personal experiences. It’s a writing method that I’ve adapted through my earlier books and it is really only achievable during the night when there are no distractions around. Many readers have been confused by who was writing what in this book and I must admit I was also confused at times. The “big team” always insist that it’s the content that’s important and not the author. BECCA: Can you describe how you get into the meditative state needed to channel? DAVID: I always attempt to clear my mind as much as possible before asking my guides to come forward. I will receive a buzzing sound in my right ear (seriously!!!) to signify that they are ready to work with me (this was developed through many years of trance and physical mediumship). I will subsequently send an adrenaline rush throughout my entire body and the spirit energy then joins with me. I will hear the guides talk to me and I can commence writing. When I wrote my previous book, “New Mediumship,” there were instances when a spirit author took me into a deeper state of trance and actually used my body to type words into the keyboard. Incredibly, after coming out of this trance state, I then had to rearrange the words as some of them were mixed up. At the end of the book, I was informed of the identity of the author. Not surprisingly, when I checked on Google, I found that he was dyslexic. You may have heard of him – Edgar Allan Poe. BECCA: You recommend mediation to achieve clarity… what tips do you offer to those who find meditation difficult? DAVID: Meditation is something that I have always personally found difficult to master. Entering a trance state has always been fairly easy for me but that involves direct communication with the spirit world and can be very tiring. Meditation on the other hand involves clearing you mind as much as possible and then just sitting in your own silence. You should not attempt to contact the spirit world during a meditation. Meditation should be used to exercise self-control over your mind. If you cannot achieve this by yourself then I would recommend joining a group of like-minded people where you can help each other to relax accordingly. BECCA: Even spiritual people seem to fear death – how can one overcome this fear? DAVID: That’s a really good question and one that I don’t really have a distinctive answer to. Everyone is different and every soul’s journey contains many unique fears – death being just one of them. As for myself, I don’t fear my own physical death, but I do worry about leaving my family behind once I’m gone. This is why mediumship is important to many people as knowing that life carries on can help a person to endure bereavement and perhaps realise that physical death is only a stepping stone to the next chapter in the book of life. BECCA: You finish your book recommending “acceptance.” How does one achieve that in the face of life’s difficulties? DAVID: I think it beggars belief that anyone who experiences their child being murdered or dying through illness should then have to accept that what has happened is perfectly natural. But, that is what they have apparently agreed to do before commencing this physical life. It is, by far, the most difficult and most important task that must be accomplished before continuing with our spiritual life journey. Sometimes we have to accept that living a successful life doesn’t necessarily mean living a completely happy one. BECCA: What do you hope readers take away from your book? DAVID: My co-writers in the spirit world only wish that any reader takes knowledge from this book. They cannot directly interfere with anyone’s life and neither can I. This book should only be used for inspiration where appropriate. I have always said that any inspirational book should appeal to someone living a life of extreme poverty as much as it does to someone living a life of material luxury. BECCA: Any advice for other independent authors who want to share inspiration? DAVID: I would advise to write about your own personal experiences of life. Nothing is more inspirational than knowing that someone else has been where you are now – and came out the other end smiling. Oh and maybe get Edgar Allan Poe to write your book – he is amazing! David Shaw is also the author of An Average Joe’s Search for the Meaning of Life, and New Mediumship. You can learn more about his work at www.spiritcounsellor.com and www.davidshaw.me.uk. 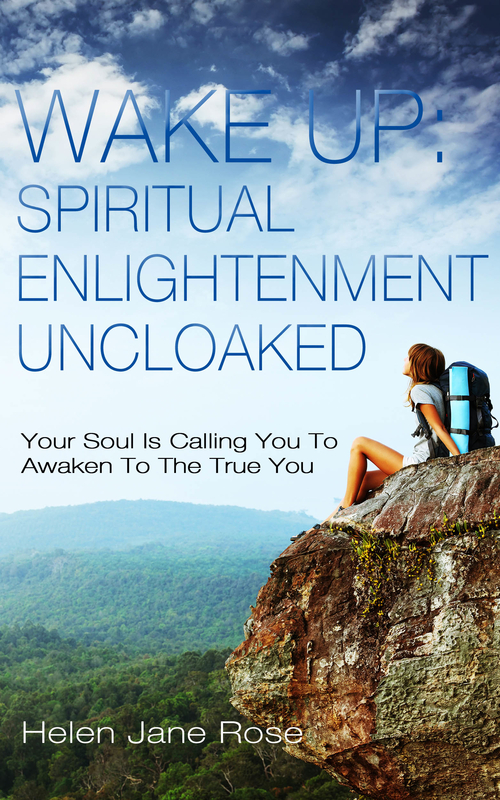 Wake Up: Spiritual Enlightenment Uncloaked is an amazingly inspirational book. I read it and then re-read it, and now find myself dipping into it regularly. The book talks directly to you, presenting what are often complicated spiritual concepts in a simple, clear way. What sets this book apart is the energy that runs through it. It’s unusual because it isn’t the author’s voice speaking to you. Helen Jane Rose wrote the book through a form of automatic writing, and you actually experience the channelled energy as you read the words. It’s a powerful read with a strong message, urging us to remember who we really are, to trust our intuition, break free from control and have faith to courageously pursue our purpose for being here. The quotations used throughout the book add to the central themes and act as powerful reminders. It’s a comforting and inspiring read that will appeal to new seekers and also those who are familiar with spiritual thought. Ernesta: Wake Up: Spiritual Enlightenment Uncloaked is a very unusual book, how did you come to write it? Helen: In my early 30’s, I had a bit of a breakdown. I was living a life that on the outside looked pretty perfect (having moved from the UK to the live in the Caribbean) but I was really unhappy in myself and my life. A friend at the time suggested I go to see a counselor, which I did. The counselor suggested that I try inner child healing, which I’d never heard of before. After our first session I followed his instructions, asking a question with my right hand and answering with my left. What happened next was life changing for me. My pen started moving so quickly without me knowing what I was writing. Although it was messy I could just about read what I had written. When I read it back I was in shock. It definitely wasn’t from my hurt inner child. It was deep profound wisdom about the spiritual path, awakening to my true self and so much about the world that I’d never ever thought about before. Ernesta: Did you keep writing after that? Helen: Yes I did, every day and kept it a secret. I started to receive guidance as to how to get out of the situation I was in. It was practical and profound all at the same time and totally mad because I never ever knew what I was going to write and always read it back in amazement! Ernesta: Did you come up with the idea for the book? Helen: No I didn’t. I hadn’t even thought about writing a book. It happened without me realizing it to be honest. When I read back what I had written one day I realized that the writing style had changed and the information wasn’t for me personally but for other people, and that’s when a book started to be formed. I had no idea when it would finish and didn’t understand hardly any of it when I read it back. It was way beyond my beliefs and perception at the time. Ernesta: How long did it take for the book to be written? Helen: I would try and write at the same time each day but then it became sporadic. Often quite late at night I’d feel the urge to sit and write when the house was quiet. I still find it incredible and so peaceful that beyond my little mind a book was brought into form that I consciously couldn’t have planned, because I didn’t understand it! I think it was written over about 6 months. But it took me years before I could honestly say that I understood what was written. In fact I was told, through writing, that I wouldn’t be ready to get the book out until I had understood and experienced its teachings! It’s taken me a long time to get there, that I can tell you. Ernesta: It’s so unusual for an author to write a book that they then learn from themselves. What’s been the best piece of advice from the book for you personally? Helen: Wake Up helped me to realize the control I had subjected myself to in my personal life and also from the world at large – it’s been a big issue for me throughout my life but I honestly only realized the extent of it after reading the book. It woke me up to first realizing this truth and then to take action to stop it. To have finally broken the chains and healed those wounded parts of me feels like a miracle! Ernesta: What advice would you give to someone who’s interested in trying this type of writing for themselves? Helen: First of all, make it a priority and start to do it every day. You won’t think you’re doing it right at first but with practice and with clear intention you will be. You must make time each day if you want to succeed and reap the benefits. We tend to spend too much time doing things that we don’t really want to do but feel we should, at the expense of putting time into what we really want to do – that make us genuinely happy. I can remember feeling guilty about the amount of time I was spending writing but it’s what I loved to do so it was crazy that I was having that inner battle for so long. Get a pen or pencil and a pad. Ideally buy a special pad just for your writing. You’ll be amazed when you read back and see how you get better and better. Make sure you find somewhere quiet where you won’t be disturbed and switch your phone off. It’s really important that it’s totally quiet without any distractions. Set your intention to first connect with your soul and intentionally forget about everything else in your mind – worries, what to do’s. Intend to literally get out of your mind. Ask your soul a question with your right hand and then swap the pen into your left hand. You may not be able to clearly read what you are writing but it will help to open your channel to higher wisdom and guidance. It’s so important to write the first thing that comes to you. Don’t wait – just write the first thing and don’t judge it. It will feel like you’re making it up – but when you read it back you’ll realize you weren’t. Helen Jane Rose is the also the author of To Fear, With Love. To read her blog or find out about her one-to-one sessions, please visit www.soulconsiousbeing.com. For more writings by Ernesta Marku visit discoveredmindpower.com.